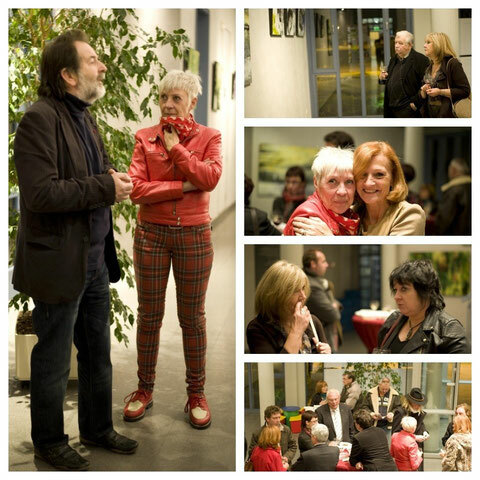 Tonight was the opening of Tine Duinslaeger's exposition in Bredene (B). Non-figurative art at first sight, but that's an illusion. Looking deeper you find elements referring to Tine's 'body & life'. Life is more than black and white, although extremes exist. Thanks for the invitation Tine & keep on surprising us with you work! "There are painters who transform the sun to a yellow spot, but there are others who with the help of their art and their intelligence, transform a yellow spot into the sun." Pablo Picasso, quoted by Don Ken. Zeer bedankt voor deze schone woorden. En bedank voor ons ook de fotograaf voor de hulp-in-nood!